Trump Endorses Romney For U.S. Senate, But Does It Signal Détente? : The Two-Way Pundits have speculated that the famously strained relationship between the president and the former presidential candidate could mean a future Sen. Romney would be a thorn in Trump's side. Trump Endorses Romney For U.S. Senate, But Does It Signal Détente? 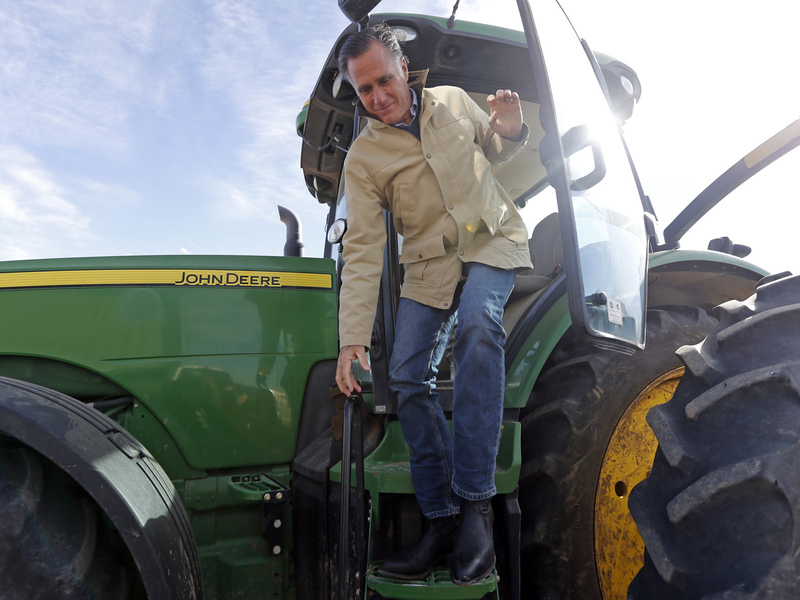 Former Republican presidential candidate Mitt Romney climbs down from a tractor during a tour of Gibson's Green Acres Dairy Friday, Feb. 16, in Ogden, Utah. Romney hopes to win the seat being vacated by retiring seven-term Utah Sen. Orrin Hatch. The strained — and often strange — relationship between President Trump and Mitt Romney just added another layer of complexity: In a tweet on Monday, the president endorsed Romney to fill the U.S. Senate seat left open by the retirement of Utah's Orrin Hatch. Trump said Romney "will make a great Senator and worthy successor to [Orrin Hatch], and has my full support and endorsement!" Romney's response (also on Twitter): "Thank you Mr. President for the support. I hope that over the course of the campaign I also earn the support and endorsement of the people of Utah." The civil words between the two Republicans are very different from some words they have used about each other in the past — words like "phony" (Romney) and "loser" (Trump). In a famously scathing speech delivered in the midst of the presidential campaign in March 2016, the former Massachusetts governor who ran unsuccessfully against President Obama in 2012 called Trump a "con man" whose promises are "as worthless as a degree from Trump University." Romney said Trump was playing Americans "for suckers" and predicted that he would never release his tax returns as promised because "he has too much to hide." Trump returned the sentiment, saying that in the 2012 election, Romney had "choked, no different than a golfer that misses a putt on the 18th hole." However, once the election was over, Romney moderated his tone and even took a now-infamous dinner meeting with the president-elect, ostensibly to discuss the possibility of becoming secretary of state in the Trump administration. Rex Tillerson got the job, and apparently nothing came of the meeting save for some awkward photos. 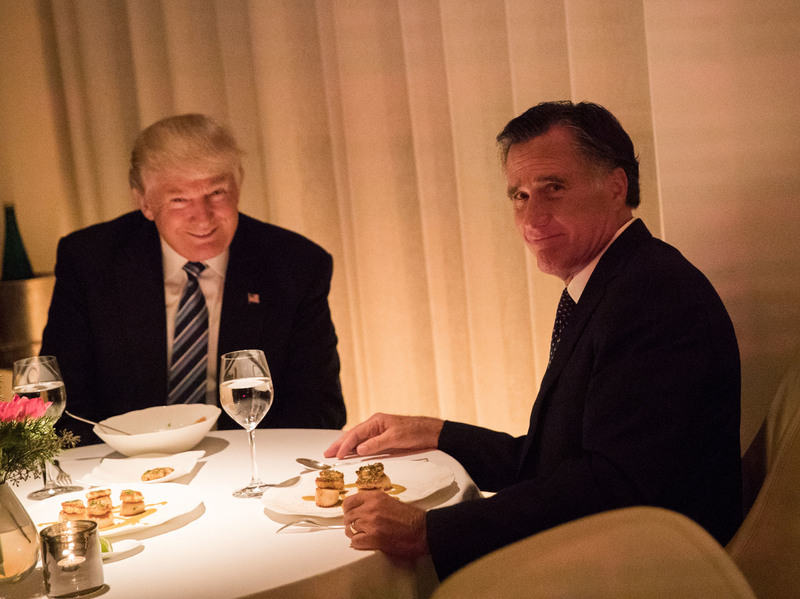 President-elect Donald Trump and Mitt Romney dine at Jean Georges restaurant, on Nov. 29, 2016 in New York City. Last year, Romney had some harsh words once again for the president, sharply criticizing his endorsement of Alabama Senate candidate Roy Moore. Further, reports late last year indicated that Trump was pressing the 83-year-old Hatch to seek an eighth term to shut out Romney. All of this has led pundits to speculate that as senator, Romney could become a thorn in Trump's side, using the legislative position to tread where many Republicans have dared not.
" ... [Given] his evident disdain, [how] would [he] get on with President Trump: as another in the lockstep Republican ranks or, some hope, a leader of resistance from within the GOP? There is ample support for either tack; voters in few, if any, states view Trump with the deep ambivalence felt in Utah." As recently as Friday, the nature of the relationship between the two men was not entirely clear. According to The Associated Press: "Asked Friday if he would seek or accept Trump's endorsement, Romney demurred but said they had talked on the phone two or three times in recent months and had a cordial and respectful relationship." At least on the surface, Trump's endorsement and Romney's response look much the same: cordial and respectful.